Pay attention to Lucky 7s. With an amazing 7 reels on the slot machine, Lucky 7s represents a major breakthrough in the historical development of online casino gambling. And the any-three-in-a-row-wins feature is equally amazing and equally innovative. Put it all together and you will find that Lucky 7s gives you not only some high quality online slots excitement, and not only a chance to win some real-money slots payouts — but also a chance to take part in real slot machine history. Let’s start with a little slots history review. The slot machine was invented by Charles Fey in the late 19th century in California. Fey’s original slot machine had 3 reels and the icons included cherries, bells, diamonds, and the lucky number 7. Why 7? No one really knows. It could be the 7 days of creation, it could be the 7 hills of Rome, but for whatever reason, 7 has come to be viewed as a lucky number by many assorted cultures throughout the world. And so Charles Fey adopted 7 as the lucky number icon on his slot machines as well. In any event, as slot machine history continued to develop through the 20th century, Charles Fey’s 3-reel invention expanded to encompass 5 reels. This was due primarily to the development of the video slot machine in Las Vegas and the online slot machine on computers screens all around the world. Not that the 3-reel slot machine disappeared — the 3-reel slots became known as “classic slots” and remained the favorites of many aficionados. But there was no escaping the fact that 5-reel slots had become the most popular slots of the late 20th century. And now, here we are in the 21st century and the slot machine has expanded again. This time it is the folks at WGS Technology who came up with the big 7-reel slot machine called, appropriately enough, Lucky 7s. As you can readily imagine, more reels on the slot machine means more icons appearing and more combinations possible, and that means more slot machine action and more slot machine thrills. 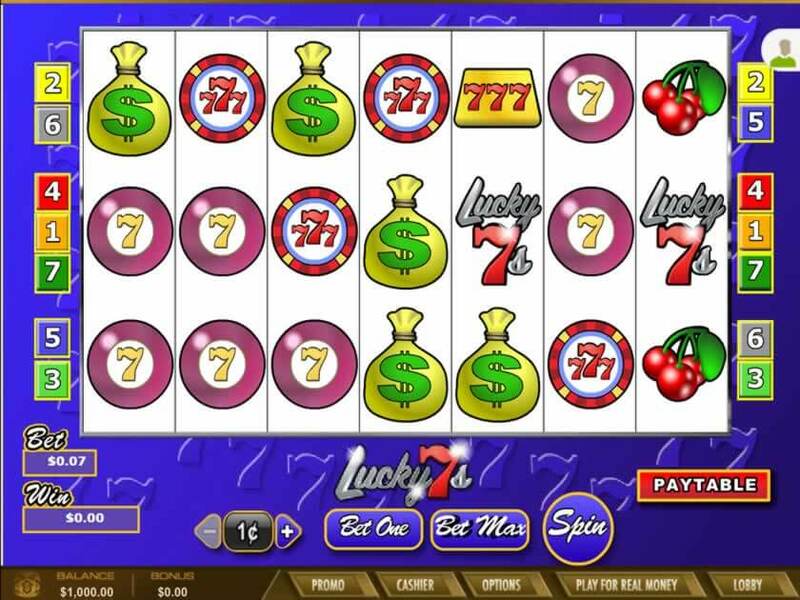 The Lucky 7s online slot machine has 7 reels and 7 paylines. The first three paylines are straight horizontals; lines 4 through 7 are zig-zag patterns that are easy to follow. The slot machine icons revolve primarily around the theme of Lucky 7. We have the 7 Disc, the 7-7-7 Disc, the 7-7-7 Gold Bar, and the Lucky 7s Logo. In addition to the 7-themed icons, we also have the traditional Cherries and the traditional Money Bag. Winning at slots is, of course, always a good thing. There are no exceptions to that rule. But winning at Lucky 7s slots is particularly exciting, and here are the reasons why. First of all, when you have 7 reels on the slot machine, it is possible to get 6-of-a-kind or 7-of-a-kind on a payline. That is a truly extraordinary win, a win that is impossible to achieve on your customary 3-reel or 5-reel online slots game. The other interesting innovation is that you can win any time you have three or more of the same icon in adjacent positions of a payline. Note that the adjacent positions do not have to start on the left-most reel, as in traditional slot machines. With Lucky 7s, you can have three of the same icon on Reels 1-2-3, or on Reels 2-3-4, or on Reels 3-4-5, and so on. As long as they are on a designated payline and they are on adjacent reels, you are an online slots winner. And, of course, with four or five or more of the same, you win even more. So you can see that there are lots of chances for good payouts in the Lucky 7s seven-reel slots game. Let us now make quick mention of the features that Lucky 7s does NOT have. It does not have a wild symbol, a scatter symbol, free spins, or a bonus game. If you feel that those features are crucial for your personal online casino satisfaction, you will need to luck elsewhere. But the developers of Lucky 7s apparently felt that the revolutionary expansion to 7 slot-machine reels, combined with the innovative any-three-in-a-row-wins feature and the clever variations on the Lucky 7 theme, would be enough to create an extraordinary and worthwhile online slots experience. We agree with the developers in this case, and recommend that you give Lucky 7s seven-reel slots a try. We think you’ll love it.